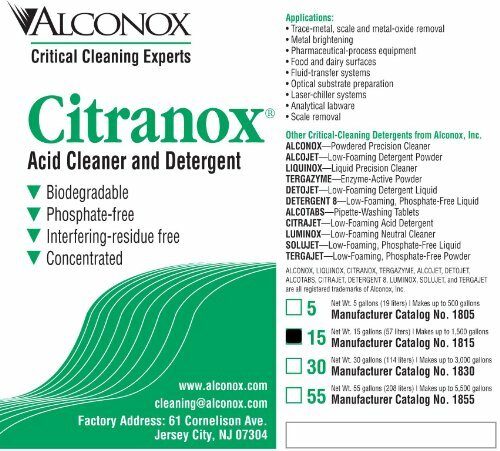 Liquid acid cleaner and detergent: phosphate free, concentrated cleaner and metal brightener for high performance removal of metal oxides, scale, salts and inorganic residues in manual and ultrasonic cleaning. Corrosion inhibited and free rinsing for reliable results and no interfering residues. Ideal for trace metal analysis. USDA authorized. Dilute 2:100. pH 2.5. If you have any questions about this product by Alconox, contact us by completing and submitting the form below. If you are looking for a specif part number, please include it with your message.